The Mardi Gras season begins on January 6 and continues until Fat Tuesday, the day before Ash Wednesday. During this time of year, one of the most beloved traditions in New Orleans is that of the King Cake. A king cake (sometimes rendered as kingcake) is a type of cake associated with Carnival traditions. It is popular in Carnival season in the area of the United States which celebrates Carnival ranging from Mobile, Alabama to southeastern Texas, centered on New Orleans. The cakes have a small trinket inside, and the person who gets the piece of cake with the trinket has various privileges and obligations. In the seventeenth century, Louis XVI took part in at least one Twelfth Night festival where a bean or ceramic figure was hidden in the cake, also known as a gateau des Rois (King's cake). The Twelfth Night cake custom is still widely observed in France, where families and friends gather around one of the different cakes served at the cake soirees. In some regions the couronne, made from a brioche dough topped with a fruit festooned sugar glaze, is favored. In Paris and other major cities, a fancier galette filled with frangipane (almond cream paste), prevail. 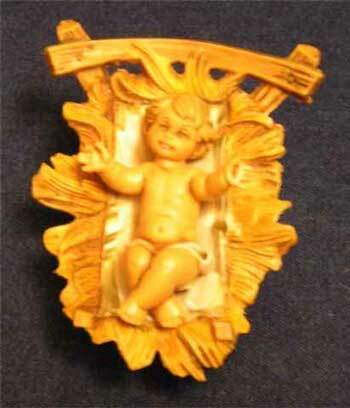 In most areas of France, a tiny plastic king or queen is baked into the galette des rois. The tradition was brought to the area by colonists from France and Spain. Related culinary traditions are the tortell of Catalonia, the gâteau des Rois in Provence or the galette des Rois in the northern half of France as well as Greek "Vasilopita." King cake parties in France refer to the galette de Rois tradition as "pulling the king or queen." The guest who receives a serving with the trinket hidden inside picks a consort. Then the pair, who will host the next King's Day Party, are crowned with the gold and silver paper diadems that adorn the cake. In France, King's Day celebrations end on January 31. France's brioche-like couronne became the forerunner of New Orleans' king cake when Creoles, colonials of French and Spanish descent who settled in New Orleans, adopted the French Twelfth Night cake custome and blended it with the Spanish tradition of mounting a grand ball on Twelfth Night. By the end of the eighteenth century, party-loving colonists had extended the tradition into an entire season of balls, which started on the Twelfth Night and ended on Mardi Gras. It is March 5th, 1878, a rather late Mardi Gras Day. Though Carnival has been celebrated for quite a long time, organized parades are still a novelty. Comus has been active for twenty years, but Rex is a mere six years old. Mardi Gras revelry consists primarily of daytime street masking and nighttime balls. Rex's parade of modern gods in 1878 was a comic display. Past parades had been followed, despite his objections, by maskers on foot. But, this year what's that we see coming behind Rex? Instead of a ragtag group of motley, miscellaneous maskers, it's another parade! For the first time a new group follows Rex with their agreement. It is the first parade of the Krewe of Phunny Phorty Phellows, spelled with "ph"es, not "f"s.
The first appearance of the PPP was a surprise to the public, and though modest in comparison with future displays, it created a sensation. Fantastic themes depicted by bizarre floats and grotesque maskers thrilled the public after the more pretentious parade headed by the King of Carnival and a live Boeuf Gras corralled on a rolling platform. "Honi soit qui mal y pense," or "Evil to them that think evil"
Its symbol was an owl. Among their innovations was the use of the term "Boss" rather than "King. The king cake of the New Orleans Mardi Gras tradition comes in a number of styles. The most simple, said to be the most traditional, is a ring of twisted bread similar to that used in brioche, topped with icing or sugar, usually coloured purple, green, and gold (the traditional Carnival colors) with food coloring. Some varieties have filling inside, the most common being cream cheese followed by marzipan. In New Orleans, the first week of January begins King Cake season, a traditional gastronomic prelude to the city's Mardi Gras celebrations. 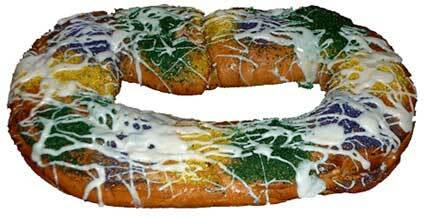 King Cakes in the Mardi Gras colors: purple, green and gold. They first appeared on the cakes after 1872, when the Rex Krewe selected those colors for its opening Mardi Gras parade. The colors come to stand for Mardi Gras and took on symbolic meanings: purple for justice, green for faith, and gold for power. Hidden in each oblong of braided coffee-cake dough is a bean or plastic baby; custom dictates that whoever finds it must give the next King cake party. 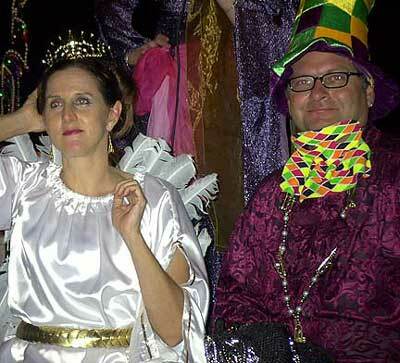 And one Mardi Gras organization even uses a King cake tradition to choose the queen of its annual ball. The season for king cake is from Twelfth Night or Epiphany, 6 January, through Mardi Gras Day. Some organizations or groups of friends may have "king cake parties" every week through the Carnival season. Hundreds of King cake parties are held in New Orleans every year. After the cake is served, the cry "I've got the baby" announces that a party-goer has received the slice of cake containing the baby or bean. That guest is King or Queen of the party, an honor that includes playing host at the following week's King cake festivity, where a successor is chosen in the same manner. King cake enthusiasm also extends to offices, which serve the cakes at coffee breaks, and to parties for children whose birthdays fall during this time (youngsters often find that a thoughtful mother has arranged for a baby to appear in every piece of cake). For the Phunny Phorty Phellows Parade the person who gets the trinket or baby is declared king or queen of the Parade, sometimes given a paper, plastic, or costume jewelry crown or tiara. There are separate cakes to select the male and female royalty; the one for women is sometimes called a queen cake. The monarch or Big Boss is usually obligated to supply the next king cake or host the next party or both. King cake parties may be held at the homes of people who live on or near the routes of Carnival parades. It is a common practice in elementary schools to have King cake parties, usually on a Friday. The person who gets the trinket is required to bring the cake the following week. 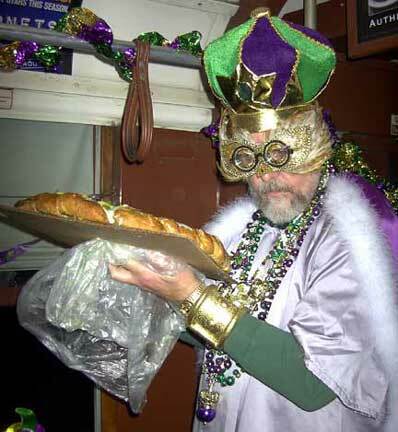 King cake parties in New Orleans are documented back to the 18th century. In some office work places, a variation on this tradition is simplified so that workers share a king cake at lunch or during the day, with the person getting the trinket having to bring the cake for the next work day, with no other ceremony. Some Krewes select their monarchs via king cake. The most traditional trinket in the cake is a bean, still seen in some European traditions but rare in U.S. king cakes. It is echoed, however, in some Krewes' use of a gilded bean trinket. 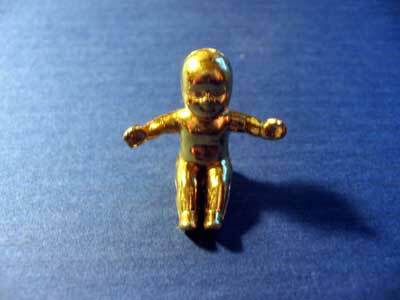 By far the most common trinket from the 1950s on is a small plastic doll of an unclad baby. Many people say this represents the baby Jesus, tied in to the connection with Epiphany. Many people attach no particular religious significance to the cake or trinket. The "baby in the king cake" was said to have become common after a local bakery chain got a large shipment of such plastic baby dolls from Hong Kong very cheaply in the 1950s, and some people say there is little further significance to the baby, but earlier ceramic baby dolls as trinkets are documented in New Orleans back to at least the 1930s. Running a distant second to babies, a token representing a king wearing a crown is the next most common design of token. Tokens in the form of other figures have also been seen historically, and starting in the 1990s again became more common in the more expensive "gourmet" varieties of king cake.